we are partners in your success. A commitment to Automotive since 2004. Beginning with our first two dealer clients in 2004 we have been focused on one thing, helping dealers become more progressive and profitable. 15 years later we are proud to have become a full circle consultancy working with dealers, manufacturers, vendors, and dealer associations for the betterment of the Industry. 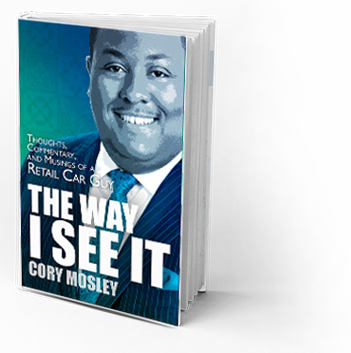 Get your copy of Cory’s highly acclaimed book that cuts straight to ‘what matters most’ and learn strategies that can be implemented immediately to build a stronger and more profitable dealership operation. Watch Industry Strategist Cory Mosley CSP every week as he covers progressive topics, interviews the industries best and brightest, and provides thought-provoking commentary that makes people better professionals, managers, dealers, and leaders. Episodes air every Friday exclusively on the CBT Automotive Network and are syndicated to ADM and Dealer Elite.